Hello, forex friends! If you’re looking for a top-tier, post-FOMC catalyst that could potentially give the Greenback a volatility infusion, then heads up because Another NFP report is coming our way this Friday (May 5, 12:30 pm GMT). And if you’re planning to trade this top-tier event and need to get up to speed, then you better gear up by reading on my Forex Preview. Updated to include ISM’s non-manufacturing PMI report, the ADP report, and Markit’s revised services PMI report. Conclusion changed. 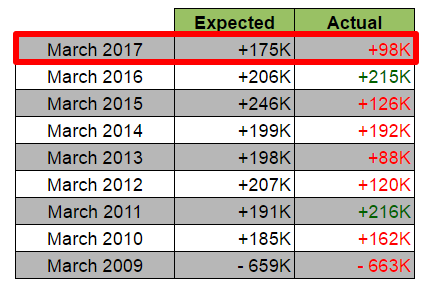 And, well, we did get a downside surprise since non-farm payrolls only increased by 98K in March, missing the 175K consensus, as well as going below the 100K floor that Fed officials and traders are keeping an eye on. Even worse, the readings for February and January both got downgraded to show that non-farm jobs increased by 38K less than originally estimated. Pretty bad so far, yeah? It does get a bit better since average hourly earnings increased by 0.2% as expected. Furthermore, the jobless rate dropped from 4.7% to 4.5%, which is the lowest reading since May 2007. And that was a healthy drop in the jobless rate since the labor force participation rate held steady at 63.0%. Overall, the jobs report was very bad, which is why the Greenback plunged as an initial reaction. However, some market analysts began pointing out that one of the sectors that suffered a massive slowdown in jobs growth was the construction sector. And the slowdown in the construction sector, in turn, may have been due to the snowstorm that hit the north-eastern United States. As such, the slowdown in jobs growth may have been temporary, which is likely why the Greenback later clawed its way back up, not to mention wage growth meeting expectations and the jobless rate falling to multi-year lows. There was little follow-through buying or selling after that, but New York Fed President William Dudley would later comment to the press that any change to the Fed’s balance sheet policy would only provide “little pause” to the Fed’s path to tightening. This was within the context of the Fed’s communications at the time about a potential balance sheet policy shift “later this year” that may result in fewer rate hikes. And this comment from Dudley apparently propelled the Greenback higher as odds for two rate hikes by December climbed (at the time). The general consensus among economists for this Friday’s April NFP report is that the U.S. economy generated around 190K jobs in April. 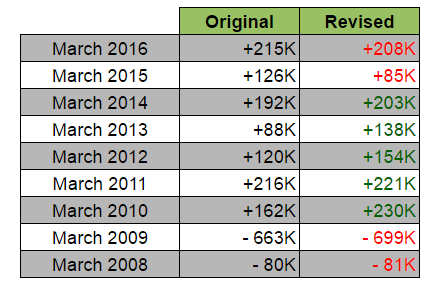 There are actually some forecast variations, but most generally fall between 185K to 195K. In any case, the consensus is that jobs growth accelerated when compared to March’s very poor reading. Meanwhile, the jobless rate is expected to tick higher from 4.5% to 4.6% but wage growth is expected to accelerate by printing a 0.3% month-on-month increase (+0.2% previous). Looking at the available leading indicators, Markit’s manufacturing PMI reading for April dropped further from 53.3 to a seven-month low of 52.8. The weaker reading reflected mainly weaker output volumes. With regard to employment, however, commentary from Markit noted that “employment growth rebounded from the seven-month low recorded in March.” Cool beans! Next, Markit’s services PMI reading improved from 52.8 to 53.1. Unfortunately, commentary from Markit on employment was rather downbeat. Specifically, “the vast majority of companies (90%) reported no-change to their workforce numbers during the month. The net result was the weakest growth in employment signalled by the survey since July 2010.” Yikes! Moving on, ISM’s manufacturing PMI also weakened from 57.2 tp 54.8. ISM and Markit disagree on employment, though, since Markit said that jobs growth in the manufacturing sector accelerated while ISM’s employment sub-index dropped from 58.9 to 52.0, which means that jobs growth decelerated in the manufacturing sector. As for ISM’s non-manufacturing PMI, the headline reading jumped from 55.2 to 57.5. However, the employment index slightly eased a bit from 51.6 to 51.4. It’s still above the 50.0 neutral level, though, so employment increased at a slightly slower pace. Finally, the ADP report printed a 177K increase in non-farm jobs, which is just slightly below the +178K consensus. In addition, the previous reading was revised lower from +263K to +255K. Okay, time to looking at historical trends. 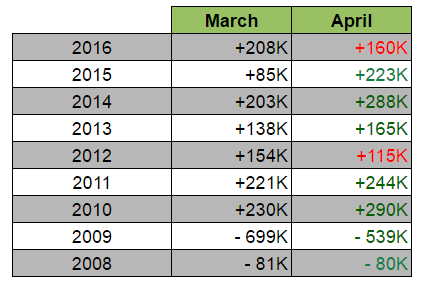 As you can see below, the U.S. economy actually generates a lot of jobs during the April period. However, the smoothing effect of seasonal adjustments voodoo means that the seasonally-adjusted reading is always much lower (or even negative). Also, the March reading usually get revised higher, although that didn’t happen in the last two years, so this year’s March reading won’t necessarily be upgraded. Moreover, there’s also a historical tendency for the April reading to be better than the March reading, so it’s possible that seasonally-adjusted jobs growth accelerated contrary to what the leading labor indicators are saying. In summary, the available leading indicators are mixed again, since Markit and ISM disagree on the labor situation in the manufacturing sector. However, jobs growth in the service sector slowed by a lot, according to Markit while ISM says that jobs growth slowed a tiny bit. Either way, jobs growth in the service sector slowed and that will likely drag down on non-farm payrolls since services account for a rather large chunk of jobs growth. Despite leading indicators signaling a slowdown in jobs growth, the consensus is that jobs growth will actually accelerate. And that’s about right (as strange as that sounds), since seasonal adjustments mean that April usually prints higher payroll numbers compared to March. It’s kinda hard to gauge whether there’s gonna be an upside or downside surprise, though, since historical tendencies show that the number of upside surprises are only slightly higher, unlike in March where downside surprises were clearly the historical norm. In any case, just remember that a better-than-expected reading for non-farm employment triggers a quick Greenback rally. And in case of a miss (like last time), then the Greenback usually gets sold off. And as usual, just keep the 100K floor in mind since that is the minimum number of jobs needed to keep up with working-age population growth, according to Fed Head Yellen herself. As such, rate hike odds are linked to that magic number and numbers above 100K generally result in minimal follow-through selling, although that also depends on other labor indicators, with wage growth usually in focus.